SHEAR BITS and CanPart have formed a strategic partnership to facilitate access into international markets. Shear Bits (Calgary, Alberta) and Shear Bits (Spring, Texas) announces that its Director and Vice President of Engineering and Manufacturing has chosen his departure from the team effective September 2nd, 2016. 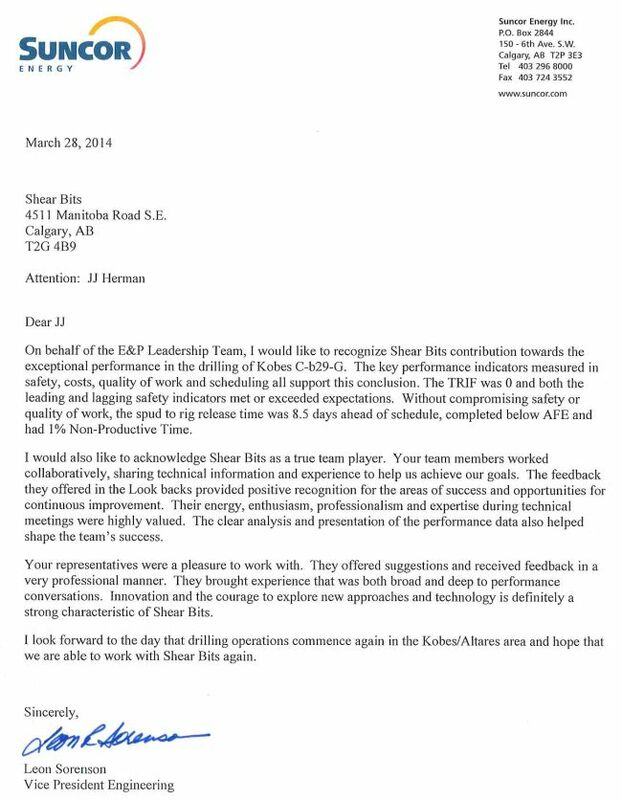 The Shear organization will continue to be led by JJ Herman, Carl Hoffmaster and the rest of the Shear Bits team. On behalf of the Directors and Management we wish him well on his future endeavors. SHEAR BITS is proud to announce API Spec Q1 and API-7-1 certification from the American Petroleum Institute (API). Verified by an on-site audit and evaluation, API requires the highest standards of quality management and manufacturing. The SPE/IADC Middle East Drilling Technology Conference and Exhibition (MEDT) hosted drilling professionals on January 26, 2016 in Abu Dhabi, United Arab Emirates. The theme for the MEDT is Leveraging Knowledge and Technology to Manage Growth. MEDT facilitates in technology transfer, exhibiting developments and technological advancements, encouraging networking opportunities, and expanding business prospects. SHEAR BITS presented a technical paper at the conference highlighting the success of PEXUS Hybrid Bits entitled: New Type of Oilfield Drill Bit Produces New Levels of Performance in Large Diameter Intervals. The paper can be accessed on the SPE technical paper website, www.onepetro.org, paper # 178150. Drill bit performance has a direct connection with the economics of drilling a well. While there have been impressive advances in both PDC and roller-cone drill bits over the previous decades, the rate of improvement has declined in recent years. New drill bit technologies are required in order to regain the pace of performance improvement, especially in large hole sizes. Traditional development cycles for novel drill bit technologies tend to be lengthy, with new products reaching commercialization after close to a decade, or more, of R&D. Critical new technologies are typically only developed by the largest oilfield service companies in the industry, which contributes to the pace of development. In order to deliver enhanced performance to the industry in months instead of years, an entirely new approach is required. As a response to this situation, a unique process has been created and implemented which has allowed a brand new type of oilfield drill bit to be commercialized within one year of the initial concept. This paper will discuss the performance of a new type of oilfield drill bit that has proven to reduce operating costs in large hole diameter intervals. This new type of drill bit has a novel hybrid cutting structure with both rotating, gouging inserts and shearing PDC cutters. This unique cutting mechanism has demonstrated improved performance compared to both PDC and roller-cone drill bits in hundreds of applications. The challenges associated with increasing drilling performance in large hole sizes are significantly different from intermediate and production intervals, and this paper will detail how those challenges are met by the new cutting structure. Worldwide, roller-cone bits have maintained a relatively large market share of sections that are 12-1/4âï¿½ï¿½ diameter and larger due to their toughness, steerability and smooth drilling behavior compared to PDC bits. However, roller-cone bit performance is still limited by the durability of bearings, seals and teeth / inserts. The new hybrid gouging / shearing cutting mechanism provides similar performance benefits to roller-cone bits, such as excellent steerability, while providing durability superior to PDC bits. The introduction of gouging cutting structures into fixed cutter drill bits is an active area of R&D in the industry. For more than a century, drill bits have failed rock via crushing (roller-cone bits), grinding or plowing (diamond impregnated / natural diamond bits), or shearing (PDC bits). The gouging mechanism displays unique characteristics compared to conventional methods, and initially appears to be more suitable to many drilling environments. In the June issue of Oilfield Technology, SHEAR BITS discusses unique new drill bit technology that has changed how key challenging intervals are drilled in "Getting ahead with hybrids"
SHEAR BITS is proud to announce that Pexus Hybrid Drill Bits are the 2015 hybrid bit world record leader as published by Hart Energy in E&P Magazine. Pexus hybrid drill bits were created to provide a performance step change in challenging drilling applications. The rotating, gouging, shearing cutting structure is completely unique and improves upon the best characteristics of conventional drill bit designs. 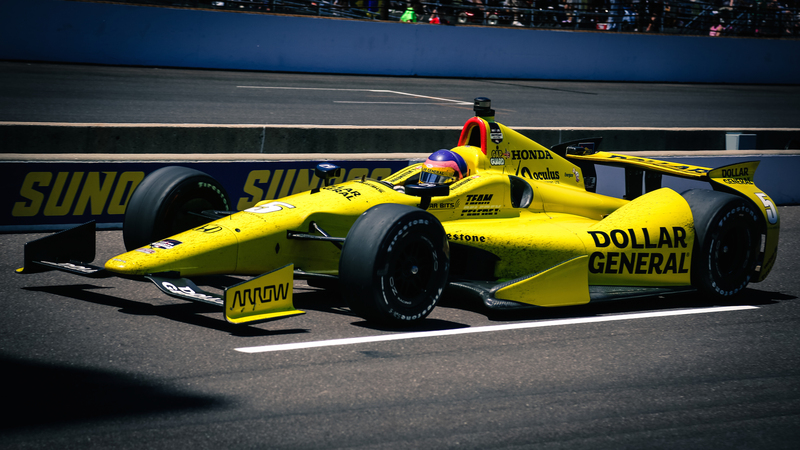 What do the Indy 500 and the oilfield drill bit industry have in common? Brutal environments and intense competition that push the limits of engineering and material science. While it is quite a leap to go from the world of the Indy 500 to the world of drilling holes in the ground in the pursuit of hydrocarbons, there are definitely parallels. For those of us that work in the upstream sector of the oil and gas industry, like the drivers and teams of IndyCar, we have to learn to perform in extremely harsh environments. I would argue that there are few, if any, situations for any kind of mechanical equipment that are more challenging than the downhole environment. Going further with the analogy into the world of drill bits, as with the photo above, the 'casual observer' doesn't get to see the 'debris marks' that provide evidence of the demanding environment where these products perform, but those of us 'in the pits' get to experience it all. One of the worst environments for drill bits is in applications where PDC cutter temperatures become very high. There are many factors that can create a high temperature environment at the cutter / rock interface, but there are few effective solutions to enhance performance in those situations. For the last 15 years, the industry has heavily utilized leached PDC cutter technology to attempt to increase performance in these types of applications, but with substantial limitations. Because the leaching process removes the metal from within the polycrystalline diamond structure, it greatly weakens the diamond and makes it much more likely to fracture under impact loads. Also, because the leached layer tends to be quite thin, there are many situations where thermal degradation of the diamond still occurs below the leached layer and causes significant diamond loss as a result. The industry therefore is in need of a thermally stable PDC cutter that retains all the toughness of unleached PCD (polycrystalline diamond). HT Cuttersâï¿½¢ from SHEAR BITS have solved this problem. 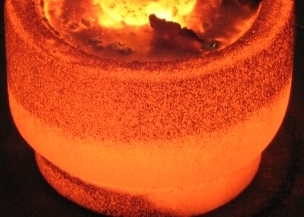 Using unique, innovative construction and manufacturing techniques allows HT Cutters to achieve a thermally stable region that is up to 5x larger than conventional deep leached cutters, while retaining the toughness of an unleached PDC cutter. In both laboratory and field tests, this new cutter achieves a step change in performance compared to both unleached and deep leached PDC cutters. 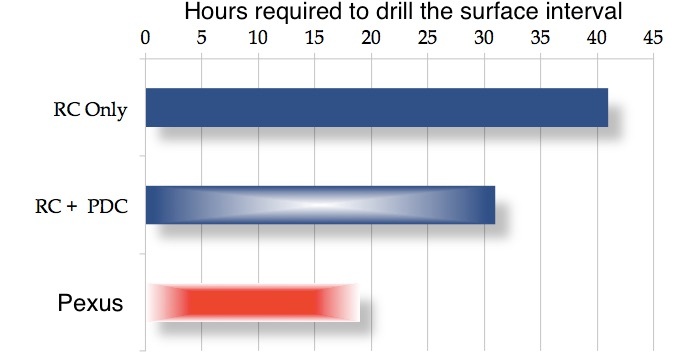 In one specific case study drilling a thermally demanding horizontal sandstone interval on a rotary steerable system, the drill bit with HT cutters provided a step change in performance compared to all offsets. 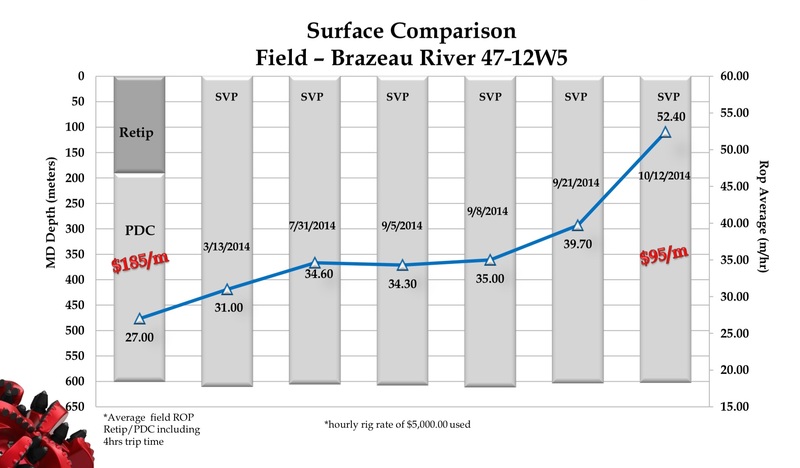 As seen in the graph below, SHEAR BITS had been making consistent improvements in performance over a span of a few months in this application. 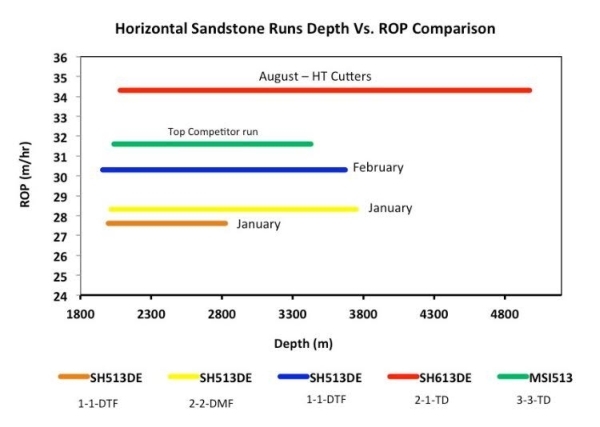 In the course of a few wells, using unleached cutters, performance was improved to a level approaching the best deep leached competitor run with the operator (the best of many dozens of competitor runs with deep leached cutters in this application). However, when HT Cutters were introduced into this application, the results were dramatic. Not only was ROP significantly increased (due to cutters staying sharper longer), but dull condition was also improved. Although the HT Cutter bit drilled over 50% further than the best offsets, it still maintained an excellent dull condition after the run. Those of us that make our careers as "bit hands", in whatever capacity, have one underlying theme that drives us: do more with less. Oilfield drill bit manufacturers, as with many other branches of oilfield service providers, are constantly in ferocious competition to consistently deliver improved drilling performance. Every year wells are drilled faster and more efficiently than the year before, and that is a situation that has not changed in decades. A well that used to require 20-30 bits to complete back in the 70's can be drilled with 2-3 bits today. Even some wells that took 30-40 days to drill last year can now be drilled in 20 days or less. 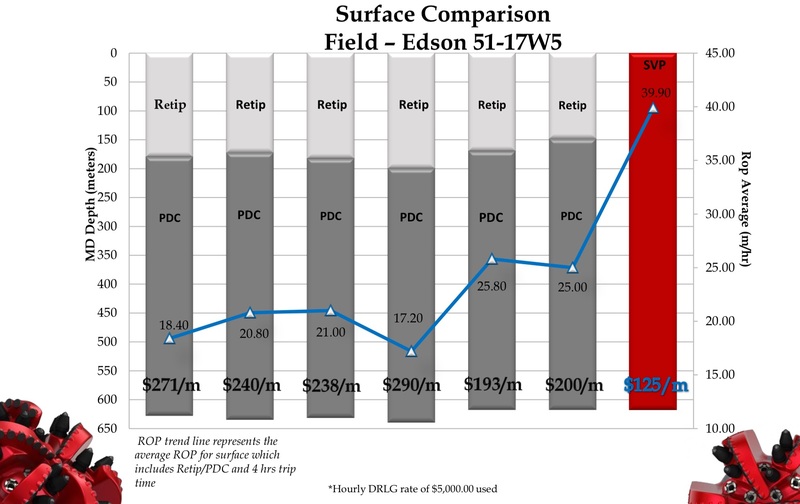 This is obviously due to many improvements to the drilling process outside of the drill bit, but there's no question that improved bit performance is a major contributor to the reduced drilling costs that have allowed some new applications to become economically viable, and to improving the economics on existing applications. The vast majority of performance improvements that have been realized with oilfield drill bits in the past 20 years have come in the form of new PDC drill bit designs or new PDC cutters. It is an interesting situation when seen from an "outsider's" point of view as few people in the world would even recognize the differences between a PDC bit from 1990 versus a PDC bit of 2015. However, although the average Joe on the street would be challenged to see the difference between that drill bit from 1990 and the one from 2015, the performance of the two bits would be worlds apart. It is not an exaggeration to say that the new bit, in a challenging application, could easily drill 10x as far and 10x as fast as the old bit, and that is likely a conservative estimate. Unfortunately, as far as PDC technology has come in the past 20 years, there remain many applications where PDC bits are not effective. Therefore, the challenge to improve performance in these applications requires a different approach. One application where conventional PDC bits are not effective is surface hole drilling throughout much of the Western Canadian Sedimentary Basin. In these applications, the top section of the interval frequently contains glacial till, which means drilling through large gravel and boulders in an otherwise soft formation. Any time that a conventional PDC bit encounters large gravel or boulders, it suffers rapid, extreme damage. It is not uncommon to break every cutter on a PDC while drilling only a few meters of large gravel. As a result, these applications, which are commonly around 2,000 ft in length, are typically drilled with two bits: a rollercone bit to drill through the gravel, then a PDC bit to drill the lower section of the interval. The reason that two bits are used is that the PDC bit cannot drill the upper interval and the rollercone bit is much slower than the PDC bit in the lower interval. As a result of this situation, while performance in this interval has seen modest improvement due to increased PDC bit ROP in the lower interval, the overall cost of drilling this interval hasn't changed much in the past decade or more. SHEAR BITS' patent-pending Pexusâï¿½¢ hybrid gouging / shearing drill bits are now consistently delivering substantial cost savings in this interval. 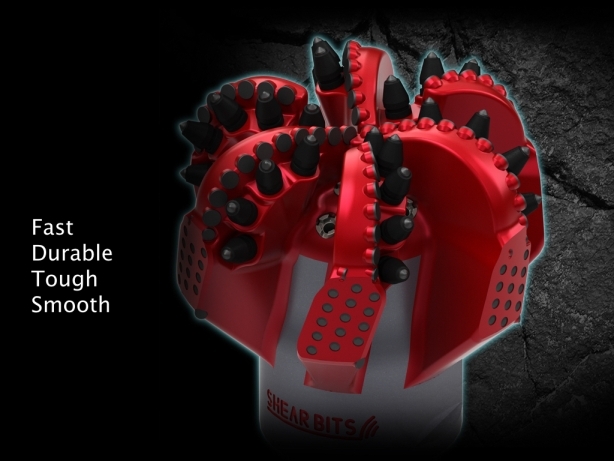 By reliably drilling the entire interval in one run at a much higher ROP than could be achieved with the conventional two-bit method, Pexus hybrid bits have come to dominate these intervals wherever gravel or boulders are a concern. The rotating, gouging cutting elements efficiently break up and dislodge the gravel from the surrounding soft formation while protecting the PDC cutters from damage. To date, over 350 runs have been completed in Western Canadian surface hole intervals, drilling over 1/2 million feet. The exciting story here is that performance in these applications wasn't improved a moderate amount, which is a more common increase in many applications when applying a new drill bit technology. In many of these wells, the surface interval was completed in about half the time of the best offsets. Increasing the average ROP of the interval by 2x has not been an uncommon occurrence in applications where Pexus hybrid bits have been utilized. 2015 will be a challenging year in the oilfield. Those of us that work in the U.S. and Canada are already seeing the effects of the downturn and are eagerly anticipating the return of higher activity levels. In the meantime, developing and applying new technologies that consistently deliver significant cost savings will be a key aspect of enhancing our industry, and we at SHEAR BITS are very excited to be a part of that process. Is there still a place for matrix bits? It is a viable argument - have matrix-bodied bits run their course in the PDC bit world? I realize that I'm dating myself, but I started in this industry in the early 1990's when matrix-bodied PDC bits were just beginning their journey toward dominance of the oil and gas drilling market. Until that point, the vast majority of PDCs used in the industry were steel-bodied bits that used post style cutters. With the proliferation of matrix-bodied bits, a huge list of improvements were achieved as a result of the change in body material. Advanced body geometries, increased body wear resistance, complex PDC cutter layout strategies with cylindrical cutters, and sophisticated hydraulic configurations took PDC bit performance to entirely new levels. Higher toughness - the type of steel used in steel PDC bits is typically 2-3x stronger than matrix. Taller / thinner blades - because steel is so much stronger than matrix, blades can be made much taller and thinner without any risk of the blade breakage that happens occasionally in matrix bits. This equates to higher ROP in applications where cuttings evacuation is an issue. Larger junk slot area & face fluid volume - because blades can be made thinner and taller, there is much more room for cuttings evacuation on a steel body bit. More hydraulic flexibility - due to the enhanced strength of the steel body, it is possible to use interchangeable nozzles in places where a fixed port would be required in a matrix body design. This allows the total flow area to be better matched to each application to enhance performance. Improved PDC cutter location accuracy - the positions of the PDC cutters on a steel body bit can be located within a few thousandths of an inch due to highly accurate CNC machining, but since a matrix body bit is a made from an oversized mold that is cast in a furnace and shrinks in an anisotropic fashion, the resulting cutter positions are frequently an order of magnitude further from design than on a steel bit. The result is that the loading on cutters on a steel bit are much more consistent, which leads to higher bit durability and better dulls. Improved PDC cutter toughness - because steel is much more ductile than matrix, the body of the bit does a better job of absorbing impact loads on the PDC cutters and therefore the cutters themselves last longer on steel bits than on matrix bits. The only issue that remained to be addressed with steel bit technology was the wear resistance of the steel body. With the development of advanced hardmetal materials and application methods, there is now available a new class of product that dramatically outperforms matrix bits in terms of body wear resistance. We call these products "composite body" bits as they are quite different from a conventional steel body bit. While these new bits retain all the advantages of steel bits listed above, they have been developed to allow a very thick shell of high carbide percentage hardmetal on all critical surfaces of the bit that protect the bit from any issues with body wear. Similar results have been achieved in many different applications around the world. Even in situations where the drilling mud contains a very high percentage of solids, composite bits outperform matrix bits. Now that the body wear issue has been resolved, and all of the performance advantages of steel bits can be realized in all applications, the question remains, is there still a place for matrix bits? It's not often that a product comes along in the oil and gas industry where an early prototype is immediately successful, and it is virtually unheard of in the world of drill bits. It is much more typical for any dramatically new drill bit concept to take a decade or more to develop from the drawing board to a field proven performer. The very first prototype ever built with the gouging / shearing cutting structure included on SHEAR BITS new hybrid bits was an enormous success. The initial runs with the first prototype were in 14-3/4âï¿½ï¿½ diameter hole in an application in Alberta, Canada that is known for large gravel and boulders in the top section of the surface interval (the images below are actual photos of samples from the bit runs detailed below). The first bit run in this application (the first prototype ever constructed) completed the interval in one run with very minor damage to the PDC cutting structure. Instantaneous ROP values were over 300 m/hr (1,000 ft/hr) in this 14-3/4" interval, and control drilling was required to deal with the quantity of cuttings received at surface. The instantaneous ROP of the new bit was over 5 times greater than that of milled tooth bits throughout the interval. The dull was in good condition after the first run, so a second run was completed with the same bit, without repair to the PDC cutting structure between runs. Before the second run began, the operator upgraded the surface equipment in an attempt to increase the speed of cuttings removal. The interval was still control drilled, but the average ROP was increased to over 70 m/hr (230 ft/hr). After the second run, the dull was again in good condition, so the bit was re-run for a third well where control drilling was again required. As seen above, even after 3 runs in this challenging application without repair, the dull was in good condition. 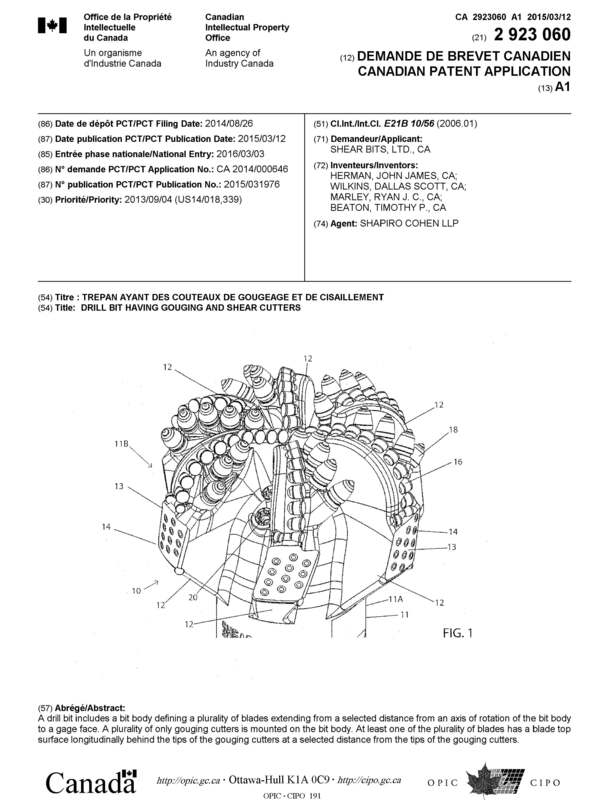 In order to qualify the application to ensure that nothing unusual was occurring to produce these high ROPs, a milled tooth rollercone was run for the 4th well on the pad. However, as per all of the offsets, the maximum ROP that could be achieved was around 30 m/hr (not control drilled). Over the past 30 years, the percentage of rock drilled by PDC bits has increased dramatically, primary due to improvements in ROP and durability, with a corresponding decrease in rollercone usage. However, despite the fact that penetration rates are relatively low and run lengths are relatively short, rollercones remain the top performer in many applications due to their smooth drilling behavior and ability to drill challenging formations such as gravel or chert. This new drill bit contains a patent pending hybrid cutting structure that enhances performance in many difficult applications. The gouging elements in the rotating inserts fail the rock more efficiently than conventional methods and work in harmony with the PDC cutting structure to produce faster, smoother, longer bit runs, especially in larger hole sizes. SHEAR goes to Indy! 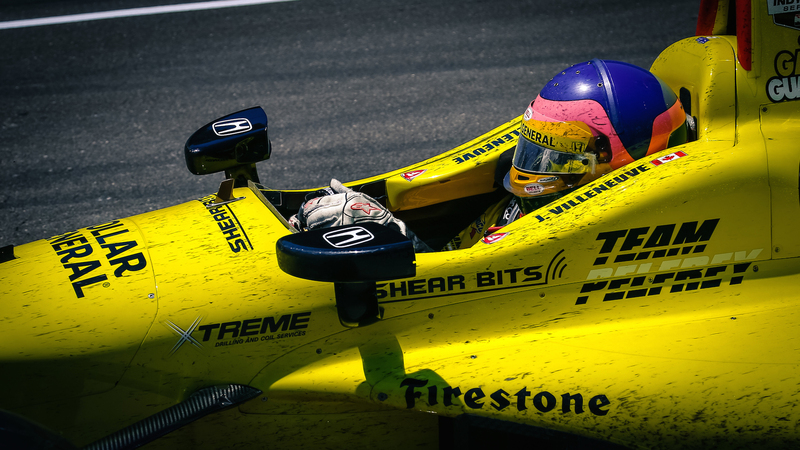 We believe in delivering ultra-high performance and are proud to have been a small part of Jaques Villeneuve's effort in the 2014 Indy 500. The focus, determination, teamwork and execution displayed in this rarified environment is an inspiration that will continue to resonate throughout SHEAR BITS' efforts in the future. We measure our speed in feet or meters per hour instead of miles per hour, but none-the-less strive to win every race. SHEAR BITS custom design approach contributes to Suncor Montney Horizontal Drilling Cost Reduction Success in northeast BC, Canada. SHEAR BITS announces the launch of HD Cuttersâï¿½¢, the next revolution in PDC cutter technology. HD, or High-Density Cutters are created in an innovative high-pressure, high-temperature process that results in PDC cutters that offer a step-change in drilling performance. Unlike traditional cutters that sacrifice toughness to achieve high wear resistance, HD Cuttersâï¿½¢ offer the best of both worlds -extreme wear resistance with excellent toughness. These new PDC cutters provide Performance without Compromiseâï¿½¢. A spectacular run was recently completed in the Pembina field in Alberta, Canada. The 6-1/4" SH613DE fitted with HD Cutters drilled a record 9,554 ft in 85 hours for an ROP of 112.4 ft/hr through the Cardium formation, a hard and abrasive sandstone. The resulting dull bit showed virtually no wear at all to the cutting structure, despite drilling nearly twice as far as the best offset run. Oil sands applications are well known to be one of the mostÂ demanding drilling environments in the industry with regard to durability.Â Â The bodies of the cutters and the body of theÂ bit experienceÂ severe wear in these applications, leading to inconsistentÂ drilling performance.Â Â Extensive effortsÂ in the past decade to solve this issue have been met with limited success. In oil sands applications, the sands are highly abrasive andÂ unconsolidated.Â Â The result is that theÂ sand particles quickly become suspended in the drilling fluid and mimic theÂ effect of sandblasting theÂ bit for the duration of the run.Â Â In many cases, the bit body wear around theÂ cutters is extensive enough to cause premature bit failure due to cutterÂ loss.Â Â The bodies of the PDC cuttersÂ themselves alsoÂ suffer extreme material loss, which leads to cutter breakageÂ and an associated reduction in drilling performance.Â Â Finally, in the lateral interval, the sandsÂ in cutting beds lying on the low side of the holeÂ cause serious wear to bothÂ the gage and backreaming portions of the bit. 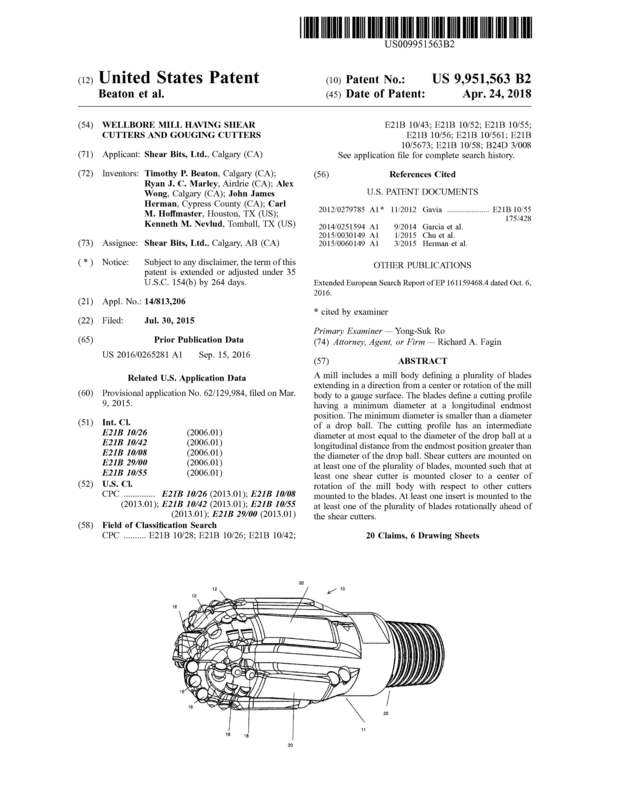 This paper will discuss new technologies that have proven toÂ eliminate bit wear in the horizontal reservoir interval.Â Â Comparisons will be made detailing the severeÂ wear experienced with conventionalÂ bits and the absence of wear experiencedÂ with identical bit designs using a new body construction technology.Â Â A novel PDC cutter will also be presentedÂ that has been developed to eliminate cutterÂ body wear. The requirements for improving drilling performance in oilÂ sands applications are as unconventional as the wear experienced in theseÂ applications.Â Â Unlike traditionalÂ applications where improvingÂ performance includes an effort to drill faster orÂ further, oil sands applications are typically control drilled and the entireÂ interval is almost always completed in one run.Â Â The focus in these applicationsÂ to augment performance is to improveÂ directional control, enhance backreaming efficiency and hole quality, andÂ increase bit durability.Â Â The newÂ technologies detailed in this paper have proven toÂ dramatically enhance each ofÂ these key performance indicators, resulting in the ability to drill further andÂ faster, while improving the possibility of success of the well completion. As horizontal drilling programs continue to proliferate across the industry, and new technologies and operational practices are developed and advanced, the reality of a one-run well has emerged.Â In various applications across several provinces in western Canada, the ultimate goal of drilling a horizontal well in one run from surface casing has been realized.Â This success comes as a function of the combined effort of the operator, directional drilling company and PDC bit company to solve the multitude of technical challenges facing a monobore strategy in areas with hole stability issues. While many horizontal applications are now utilizing a monobore (one hole size) well plan below surface casing, the vast majority of those applications have one critical aspect in common - the upper hole sections are in very stable formations that can be left open for long periods of time.Â This is a critical aspect due to the fact that nearly all horizontal wells require multiple bits and multiple BHA configurations to reach total depth (TD).Â In areas where hole stability is an issue, an intermediate hole section is typically included in the well plan to seal off the unstable formations to allow the lateral interval of the well to be completed.Â In addition to the added time and costs required to set an intermediate string of casing, this type of well plan also results in a smaller hole size in the horizontal section. In order to complete a horizontal monobore well through unstable formations, the well must be drilled in a very short period of time and must be drilled with excellent hole quality to eliminate any issues with rapidly completing the wells.Â This paper will detail a variety of these types of applications that successfully reached TD in 4-6 days from surface casing and were completed without problems. This rapid monobore well approach leads to both huge cost savings for the well and a larger hole size in the reservoir for improved production.Â The resulting wells are more economical, are drilled in much less time than conventional wells, and yield greater returns. Our PDC development team is staffed by industry experts that worked closely with Shell Canada to develop two impressive bits for an Oil Sands application. Both bits were designed and produced in just a few short weeks to meet our customerâï¿½ï¿½s urgent needs. The new 10-5/8âï¿½ï¿½ SD616E5 achieved an outstanding run in Peace River, Alberta for Shell Canada in the build section of the well. It almost doubled the average ROP compared to offsets. Getting the job done in half the time means reducing operational costs therefore saving both time and money for the customer. In this type of application it is common to use roller-cones due to the soft formation and directional requirements in a larger hole size. Thanks to our Directional Series design configuration, steerability and directional performance were excellent, and thanks to our unique cutter technology, we were able to achieve multiple runs without repair. The proprietary cutter technology used for these bits in an intermediate build section, allowed for exceptional wear resistance delivering an overall unmatched level of service. We are proud to offer products with superior quality and performance. Meanwhile, in the same application, another successful custom design for Shell Canada, the 7-7/8âï¿½ï¿½ SH516DE, has achieved an extremely high ROP and comes out in excellent condition after commonly drilling at least 5 legs without repair. 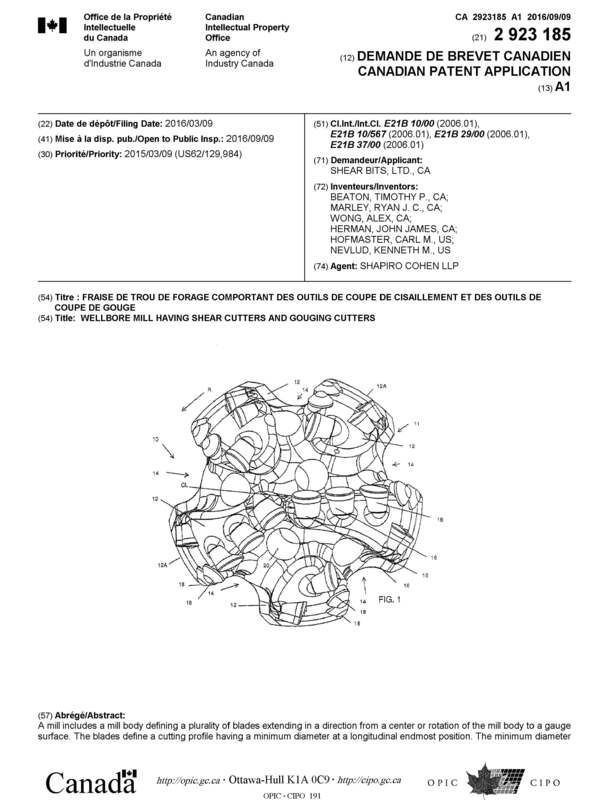 In comparison to the cutters our competitors use that will wear after only one leg, our unique, proprietary PDC cutters donâï¿½ï¿½t even wear after 5 legs. In one particular well, the 7-7/8âï¿½ï¿½ SH516DE hit lots of calcite toward the end of each leg, but the bit came out of the hole in repairable condition. Competitor bits used in the same well were destroyed (rendered damaged beyond repair) upon hitting the calcite formation. Our Directional Series PDC bit now replaces rollercone bits effectively and with minimal damage and excellent ROP in the build section, and our Horizontal Series PDC bit dramatically outlasts and out-drills competitor PDC in the multiple lateral legs. SHEAR BITS focuses on developing PDC cutters to achieve exceptional wear resistance without compromising toughness. We are thrilled to announce our new non-leached, ultra-dense cutters that reach new levels of wear resistance and thermal stability with much higher toughness than deep leached cutters. The ultra-dense construction equates to a low metal content in the diamond table, producing excellent thermal stability and retaining great toughness. Until now, non-leached cutters could not keep up with deep leached cutters in the most abrasive drilling environments, but with this new technology, that has all changed. SHEAR BITS' new PDC cutters deliver the best of all worlds - extremely high wear resistance, high toughness and high thermal stability. Leached cutters are yesterday's news. For more information on non-leached cutters, please contact us at info@shearbits.com. A record run was recently recorded for a Multi-Row Series PDC bit with a key operator in West Texas. 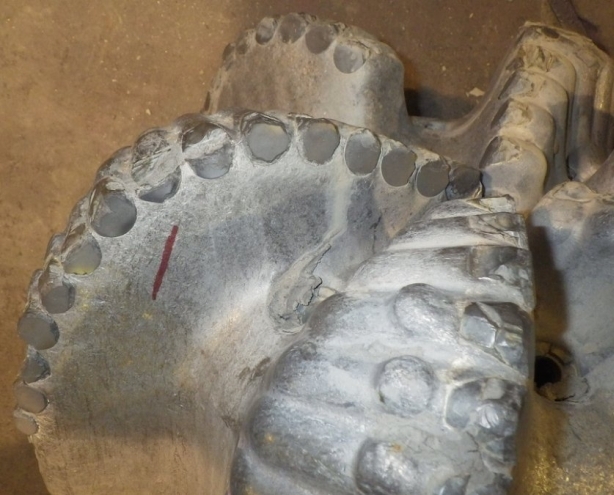 In an application where offset wells required multiple bits to complete the interval, and where bits are frequently damaged beyond repair, the 12-1/4âï¿½ï¿½ SM616 drilled 4,497 ft in one run and was pulled in repairable condition. 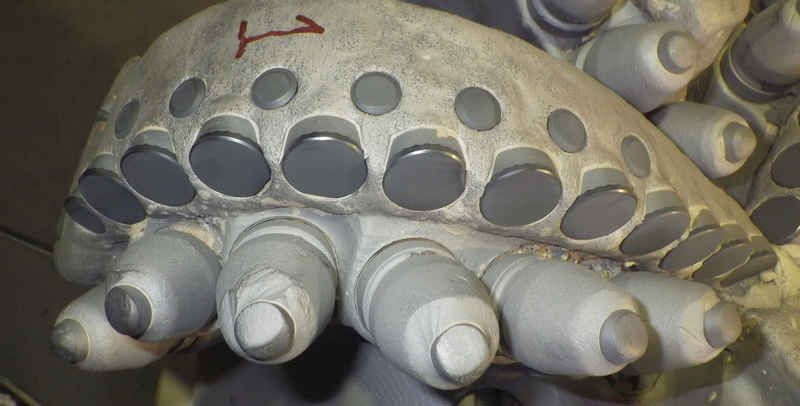 This one run footage represents an increase of over 300% compared to a close offset well where 2 of 3 bits were destroyed - a great example of the exceptional wear resistance of Multi-Row Series bits in harsh drilling environments. info@shearbits.com. We are extremely excited to announce the formal decline of matrix-bodied PDC drill bits. One of the applications where matrix-bodied bits were considered a must for an acceptable level performance was the oil sands in Western Canada. In these applications, the sands are highly abrasive, soft and unconsolidated - the result is that the sand particles quickly become suspended in the drilling fluid, which effectively sand-blasts the bit for the duration of the run. Additionally, as these are horizontal applications, the sands in the cutting beds lying on the low side of the hole are infamous for wearing out the gage region of PDC drill bits. SHEAR BITS new, proprietary, composite-body construction for PDC bits has performed so excellently in these applications that our customers will no longer run our matrix-bodied bits! 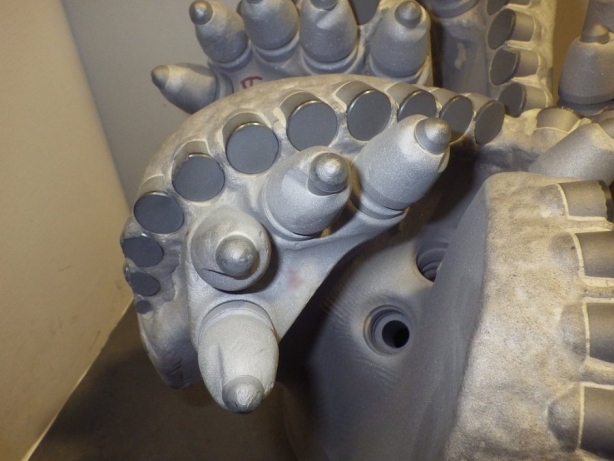 Our customers have learned that the dull condition of the composite-body PDC bits is so far superior to that of matrix-bodied PDC bits, that overall performance is greatly enhanced in challenging oil sands applications. For more information on composite-body PDC bits, please contact us at info@shearbits.com. CUTTING EDGE PERFORMANCE: A spectacular run was recently completed in a Midale horizontal application, drilling a monobore well from surface to TD, for a total of 6,897 ft drilled (2,102 m), with one 7-7/8" SD413E at an average ROP of 129 ft/hr (39.5 m/hr). This run represents two impressive records for southeast Saskatchewan - the longest single bit run from surface to TD in a horizontal well and the fastest horizontal well to reach this depth. TD was reached within 6 days of spudding surface! SHEAR BITS is excited to announce that we have partnered up with Lone Star Drill Bits in Corpus Christi, TX to service the South Texas region. Billy Gillen, owner and operator of Lone Star Drill Bits (www.lonestardrillbits.com), has worked in every aspect of the drill bit industry since 1977, and he and his team bring a wealth of local experience and expertise in applying PDC drill bits to South Texas drilling programs. Extensive product development is already underway to maximize performance in Eagle Ford applications! SHEAR BITS is proud to announce our support of Oil Patch Kids in the Permian Basin, Texas. Please see www.oilpatchkids.org for more information. Matrix-bodied PDC drill bits have officially been replaced by a new body construction that offers dramatic improvements in drilling performance and body wear resistance. Â Over the last 5 years, the industry has conclusively proven that steel-bodied PDC bits outperform matrix-bodied PDC bits in most circumstances, but there remained some applications where steel-bodied bits suffered severe erosion issues compared to matrix-bodied bits. Â SHEAR BITS' new proprietary bit body technology has recently proven to be significantly more wear resistant than tungsten carbide matrix while maintaining the performance advantages of steel-bodied bits. Â In a recent heavy oil application, an 8-3/4" SOH616 drill bit with the new body construction drilled the entire horizontal leg and the resulting dull displayed no wash or material loss around the cutting structure. 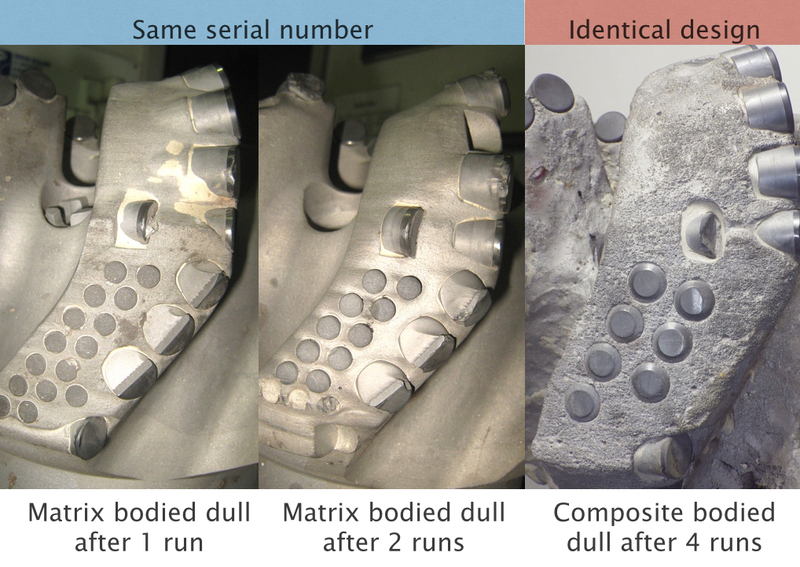 Â On direct offset wells, matrix-bodied bits suffered significant body wash and matrix material loss. As SHEAR BITS continues it's commitment to providing the industry with rapidly delivered innovative technology, we would like to take a moment to congratulate the manufacturing, engineering and quality teams for passing the ISO 9001:2008 renewal audit with no findings or corrective actions. In a rapidly growing business, it is a true testament to the team's focus on delivering consistently high quality to achieve recertification with no issues. New performance thresholds continue to be recorded in the Spearfish play in Manitoba / North Dakota. Â The 7-7/8" SD413E PDC drill bit was custom designed for the monobore wells drilled in this region, and the bit performance has been optimized over a series of applications in order to find a balance between the extremely high ROP required in the vertical section and the steerability required to complete the build and lateral portions of the well. Â Recent runs as fast as 250 ft/hr have been recorded in a region where the best competitor offsets are less than 160 ft/hr. Congratulations to the SHEAR BITS team for achieving ISO 9001:2008 certification for the design and manufacture of oilfield drill bits. Passing the audit with no non-conformances is an excellent demonstration of SHEAR BITS commitment to superior quality standards. SHEAR BITS designs, manufacturers and distributes innovative fixed cutter drill bits for applications all over the world.